In the Tarot, a deck of cards used for divination, based on a compilation of symbols and myth, The Major Arcana card The Fool is often pictured as a happy character about to step off a cliff without a care in the world; it’s a picture of a new beginning and the individual has all he or she needs to make the move/change. The interpretation of this card is varied – depending on the individual and other cards in the reading – but it generally incorporates some degree of faith. Much like the scene in Indiana Jones and the Holy Grail – where the character steps off the cliff onto a hidden/camouflaged wall to walk across to the room wherein the grail is kept. It is the combination of passion, ambition, intellectual prowess and faith, together, that affords the conclusion that a platform is present. It supports the idea that one will be rewarded or have success by following one’s bliss, or by taking the next step and having faith in one’s convictions. One needs to do his work, be learned and informed as well as be faithful and flexible, incorporating the intellectual knowledge and faithfulness. This set of actions of combining intellectual investigation and leap of faith toward a new beginning or a change in course, is the best description of The Fool card in the Tarot, and an efficient style of negotiating movement in the world. We cannot fully know the outcome of our choices – we may be able to make a calculated guess about the result – but the outcome may be affected by the dynamic aspect of the world and other factors unknown to us. Therefore, major decisions are both intellectual and faithful. Whether to marry, have children, go into a specific career or change careers these important decisions require a combination of intellectual investigation and faith. If we do not incorporate a certain degree of faith into our decision-making process then we may be limited in our choices, and actions, to things provable (and many of the above kind of decisions are unprovable). Thereby missing out on opportunities (not taking a step) or (taking a mis-step) by not paying attention to some intuitive element of the decision that would have said don’t do it. Faith is equally as important as our intellectual investigation and intuition in decision-making. The actions of (1)/ being too willing to ignore cues that there either may (a)/ be a problem or (b)/ direct you on a course, as well as (2)/ not being willing to act, due to the fear of looking foolish, all can interfere with mindful decision-making. Paying attention to intuition means to stop, look, listen/feel as you are processing information in decision-making to determine if something is off. It helps to focus in on our assumptions and see if we are connecting dots that should be separated. This is especially true when we have a specific picture we are trying to create. If we push too hard to get that picture we may miss the real BIG picture of the outcome. There is a pressure to skip those funny feelings of concerns or to let fear run the decision-making process. Too much push or pull and we are exchanging faith for attachment, which can be damaging because it shifts the energy away from flexibly and dynamically creating. The concept of attachment here is having too rigid of a picture of the outcome. That makes the process too rigid and inflexible, no room for intuition. However, if we don’t allow ourselves to be pulled a bit by our intuition or sense of what we are trying to create (faith) then we may miss a great opportunity. A balanced, mindful, flexible approach to listening to intuitive information, and an open-minded approach to mindful investigation, is the best process. 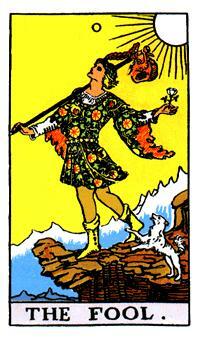 Keeping the energy of the fool card happily stepping off the cliff, is trusting faith and yourself. Pay attention to your inner sense about something while you are developing a plan about what you want to do, or how you want to make a change. Then, while allowing for rapid changeability to address the dynamic process of the fabric of life, you can remain in-step with the fabric of your life so you may evolve, and create what you want. Be free and easy with an inner compass of conviction and you will find that decision-making will feel less risky and more joyful. That inner compass can keep you on track, so you don’t lose yourself, and the free and easy part can allow for flexibility, so you may find an even better way in your life. It’s like a combination of the Tree Pose in Yoga and The Fool card in the Tarot. The first is a way of centering and the second is a way of moving.